After our heady series of events on Saturday, it was Wednesday bookgroup last night, and today (Thursday) we ran two storytimes to coincide with World Book Day. The 2pm session was a very tight squeeze in the children's room, so for the 3.45 session we decamped into the main part of the shop. Thanks to everyone who came along, and listened to Alison and I reading some of our favourite children's stories, we hope you enjoyed our selection! The big event this week, however, was our Spread The Word: Books To Talk About event on Monday. Of the ten authors shortlisted for the £5,000 first prize (announced today), we were honoured and delighted to welcome two of them - Angela Young and Eliza Graham - to Abingdon for the evening. 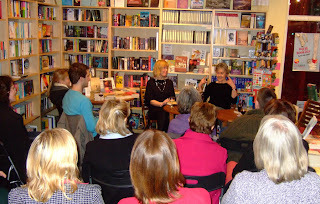 It was a small triumph that - considering both are first-time authors - we were able to fill the shop on a Monday evening, testament to the success of the Books To Talk About competition, and the quality of the books themselves. Both Angela and Eliza are hugely erudite and entertaining speakers, by the way, and talk about their writing lives with a great deal of passion and honesty. I'd pitched the event as a chance to hear two first-time authors talk about their experiences of getting published, and the impact of being shortlisted on their writing careers, as much as being about the books themselves. Both authors willingness to be extremely candid (!) together with plenty of interaction from the audience combined to create a great deal of energy throughout the evening, making it possibly the most enjoyable (and certainly the most satisfying) event we've ever run in the shop. We also had at least three bloggers at the event (that I know about, and not including the authors!) and Simon Thomas has written a wonderful review of the event, which will probably put my ham-fisted, sleep-deprived prose to shame - but here goes. I asked both authors to first give me an overview of their "route to the shortlist" - how they got published, how they got on the longlist, and the impact of being in with a shout of the prize on Thursday. Eliza is now published by Pan, but she came up originally through Macmillan New Writing, Macmillan's groundbreaking publishing initiative once cruelly (and very inaccurately) dubbed the "Ryanair of publishing". In fact, her experiences very closely mirrored those of Jonathan Drapes, another MNW author, who we had at Mostly Books last year: wonderful support, excellent editing, a publisher using revolutionary 21st century technology, such as email submission of manuscripts - fancy that! Having had "mixed" experiences of an agent previously, Eliza appreciates the straight dealing with Macmillan. As you'd expect from one of publishing's aristocrats, they were very smart in marketing her book. It narrowly missed being on the Richard & Judy list, and was then submitted for the Spread The Word 100 Books To Talk About. Angela on the other hand has been published by Beautiful Books, a tiny independent publisher based in London. Her route to the shortlist couldn't have been more different - and it's very revealing in what it says about the realities of an author getting their book noticed even after it's been published. Authors (even those who have achieved some success) are increasingly expected to market (and sometimes even sell) their own books. Angela's experiences show what you can do by getting creative if - crucially - you have a quality book, and you have belief in it. Angela originally googled "small, independent publishers" and chose seven from the search results. One of them happened to be just around the corner from where she lived, they loved her book, and it was published in hardback midway through last year. Angela also searched for resources on marketing her book - including all the awards available to first time authors - and worked very closely with her publisher on submissions to several awards she thought the book was best suited to. One very strong element for Angela is the cover design - in fact, Waterstone's admitted that (prior to the shortlisting) the cover design was a huge factor in selecting her book. Having got on the shortlist, life has become pretty hectic for the two authors. Eliza admitted that it's helped her internally within Macmillan, being summoned to a few more marketing meetings with the reps. For Angela, the effect of being shortlisted is a huge vote of confidence for a book whose journey has taken several years. And of course all the publicity should ensure healthy sales - nothing less than both of them deserve. Both writers also admitted cheerfully to innovative (but ethical!) techniques to maximise their chances of winning. The feeling was that this aspect of the competition - what is essentially a "Pop Idol" of books - has some weaknesses and does leave the award open to criticism (Candi Miller recently blogged about this for the Guardian). Both had suggestions of ways the competition could improve next year, and if you think about it, changes might need to be made. Next year everyone will be in on the secret and looking to 'game the system'. Having discussed how the books got on the list, I thought it best if we found out some more about the books themselves - here are both authors reading extracts, courtesy of YouTube. 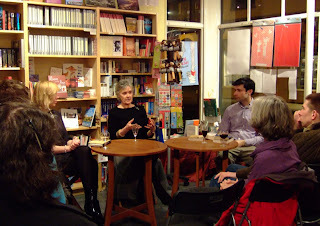 After more questions, we did what we always do at Mostly Books events and break the formal part of the evening, allowing people to talk directly with the authors, refill their wine glasses and get books signed. I was particularly pleased to be able to introduce various people who, before Monday evening, had only swapped comments on blogs. The Internet can be a heady experience for authors, but it is always nice to be able to step out of the sometimes ephemeral and transitory world of blogs, websites and emails, get to the know real people and make proper connections in the flesh - John Naisbitt's "high touch" against the "high tech". It really was a great evening, and I'd like to thank everyone who came and contributed. Everyone was very complimentary about the shop and the way the event was run, so it was unfortunate that I completely forgot to ask either author to sign books for the shop at the end of evening. Thanks to Angela for coming back in the next day to remedy this (Eliza will be coming back Saturday morning). Room for improvement there I feel. This morning Jonathan Trigell's Boy A was announced as The Book To Talk About 2008, but you know, I don't think it's going to matter too much to the other authors on the list. The shortlisting itself has given all of the authors a chance to set out on extremely successful writing careers, and both Angela and Eliza have earned their opportunity through sheer talent and merit. I hope they enjoy the ride. What a wonderful report of a wonderful evening. Thank you, Mark. But your modesty has prevented you from saying a couple of things, so I'll say them for you. First you chaired the evening with such enthusiasm, knowledge and humour - it couldn't have been the success it was without your obvious love of books and the way you make people feel so very welcome at Mostly Books. Abingdon is a lucky town to have you and Nicki and Mostly Books in their midst. And, second, your modesty prevented you from blogging about your superb course for first-time writers, Shelf Secrets, which I came to last August and which gave me such insight into what it is that booksellers are looking for (things that I had no idea about and which I think most first-time writers don't know about). After Shelf Secrets I approached several indy booksellers with Speaking of Love and had some success, but the most important thing I discovered from that course was how important it is for a writer to get behind her book. The work doesn't stop when a publisher says 'yes'; it's then that a different kind of work begins. You are an inspiration, Mark, thank you. Thank you for this post. I couldn't come on Monday evening, so it was good to have your account and in particular the YouTube extracts.